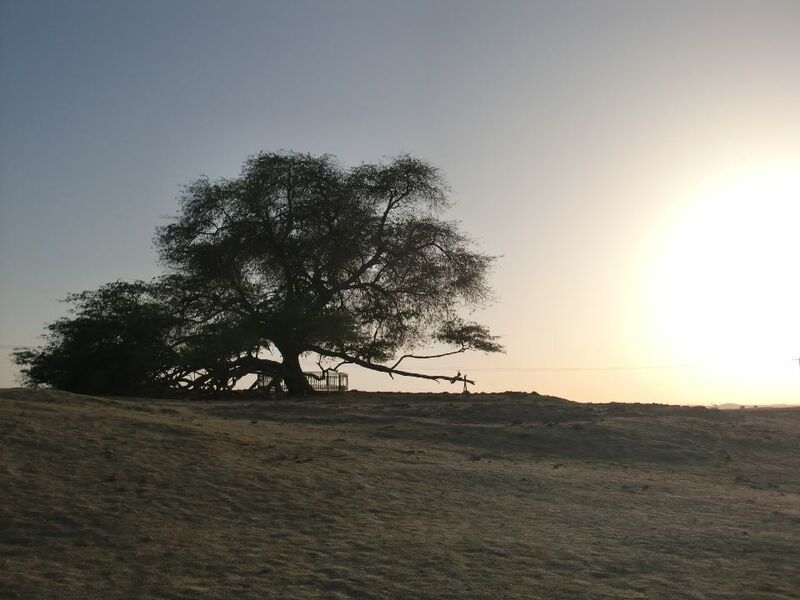 To boil it down, the Tree Of Life is essentially a very large mesquite tree growing quite randomly in the middle of Bahrain’s desert, surrounded by endless oilfields. About an hour’s drive south from Manama, it’s extremely difficult to find. As you drive outside Bahrain’s capital city, there’s a single sign pointing you south to the tree (as if there’s any other direction to go); from there you’ll have to wing it by asking any and everyone along the way. Maps of the desert roads aren’t very reliable, even for the navigationally-gifted. I actually drove right by the Tree Of Life, thinking, “wow, that’s a rather large tree growing in the middle of nowhere.” That was until I ended up perilously close to the military base nearby (which you will too if you don’t make the final right turn). I was quickly turned away by a group of soldiers standing under a large sign warning people not to go near the complex. Let’s just say they didn’t find my poor sense of direction endearing or the least bit amusing. Nobody really has a good answer as to how the Tree Of Life has grown so large with a severe lack of water, though there are several local legends. Whether it’s water gods or an undiscovered subterranean well, aisde from some graffiti, the Tree Of Life doesn’t seem bothered at all by its lonely surroundings. There is no cost to visit the Tree Of Life, though you’ll pay a hefty fee to visit by taxi (25-40 Bahraini dinar ~$70-110 USD). Like most of the other things to see in Bahrain, you’re much better off renting your own car. The Tree Of Life is something I had been wanting to visit for a very long time. How I stumbled upon it originally I can’t say, though to enhance the experience I suggest you arrive around 4-7pm. Aside from the benefit to your photos by the light of sunset, you’ll catch the groups of oil workers returning to their camps in the desert. The sands become alive around this hour, with soccer matches between various groups of workers, and makeshift barbecues throughout the outdoor encampments along the oilfields. Why on Earth would you spray graffiti on such a beautiful tree? I don’t understand it either and it’s a shame people do it in the first place. Maybe it’s the tree left over from the garden of eden! That’s why! Anil: I love this post. The Tree of Life is the kind of site I am always on the lookout for; quirky, out-of-the-way, little-known, but intensely fascinating. Thanks for sharing this great photo. I think visiting the tree and seeing the surrounding camp life gave me a new appreciation and fascination with desert life in general. There is a strong sense of bond with a sight like the Tree Of Life, when it’s just you and it in the sands. I hope you get to experience it one day there as well. That is really cool. What a fun discovery, gunmen aside! It’s funny how people lack respect for what we consider historically significant or sacred. I saw graffiti on Mohammed Shah’s tomb in Lodhi Gardens. It was weird. A stunning photo & loving these posts of Bahrain, I know little about it so this enlightening! Graffiti is so 80s isn’t it?? I don’t understand it either, especially at a site that’s so remote. You drive out there to spray paint a tree…sheesh. Thats amazing to see a big tree like that growing in the desert, would be one of the last things you expect to find there. Wow, how did a tree of that size grow like that in the middle of nowhere? Yeah, it’s more of a rhetorical question but that’s fascinating!